It’s no secret that smartphones and poor battery life go hand in hand. They may have improved things over recent years, but it is still a worry for most users. And while most smartphones have replaceable batteries, not all do, meaning carrying a charged spare battery isn’t a option. 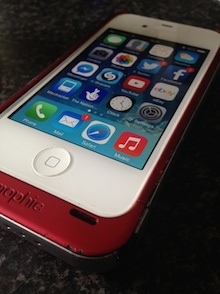 In the past I have written about the Mophie Juice Pack Plus – a case for the iPhone that incorporates a battery so you can charge your phone when out and about. See Juice Pack Plus Review and Juice Pack Plus Revisited. The idea behind the Juice Pack Plus is great, but it does add considerable bulk to your device. Initially I thought I could live with this, but after a while it began to bug me. And while this might sound petty, I recently upgraded from a black iPhone 4 to a white iPhone 4s, and having a black Juice Pack on a white phone annoyed me. So I began looking around for a white or red Juice Pack Air. There are two versions of the Juice Pack Air as far as I can tell. One is a complete enclosure, covering the top and fitting together with a top half and bottom half the same as my Juice Pack Plus. Then there is the model I picked up: It has a small section on the bottom that comes off, and the top edge of the phone is open. 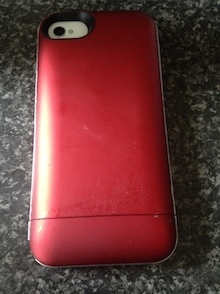 I picked up a battered but fully working “Product Red” edition Juice Pack Air. It looks quite nice against the white phone. The moment you fit a Mophie case, your attitude to charging changes. You know you have that option to “flick it on”, so you don’t panic if you are down to 10% and sitting on a bus. It does tend to charge a bit slower than usual, and now you have both the phone and Juice Pack to charge, so overnight will fully charge both. It takes around 5 hours to fully charge both. 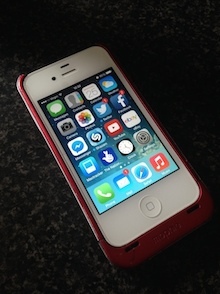 Thursday 3rd July – 8am – iPhone and Juice Pack Air fully charged. 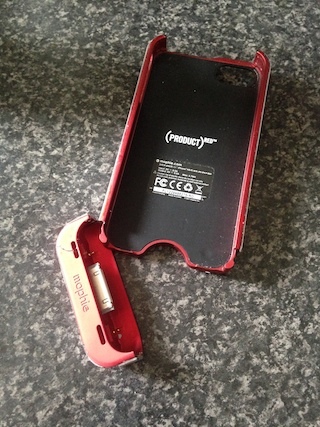 Friday 4th July – 10am – iPhone runs out of battery after 26 hours. 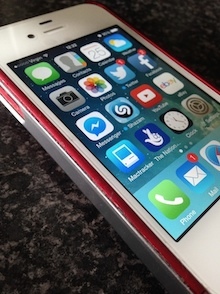 Friday 4th July – 10am – Juice Pack Air is switched on to charge iPhone. Friday 4th July – 12pm – Juice Pack Air charges phone to 67%. 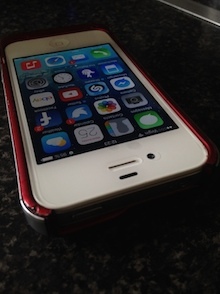 Saturday 5th July – 8am – iPhone runs out of battery after 20 hours. That’s 48 hours before it needed plugging in. It might not sound amazing, but it doubled the life of my phone and adds that assurance. The Juice Pack Air is slightly thinner and shorter than the Plus. The downside of this is the battery in the Juice Pack Air is only 1500 mAh vs the 2000 mAh in the Juice Pack Plus. This means the Juice Pack Air will give your phone around a 70% charge vs. the 120% charge of the Plus, so the Juice Pack Air won’t fully charge your phone but the Juice Pack Plus will fully charge it and still have a little extra left. 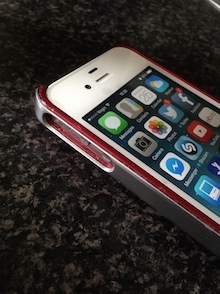 The left hand side of the Juice Pack Air has an opening so you can access the silence switch and volume buttons. These are recessed in the case and can make it a little tricky to use. The Juice Pack Plus only has the silence switch recessed, as the volume buttons are rehoused in the case. As the 30-pin connector is enclosed in the case, so you have to charge via the Micro USB port on the side. Don’t worry, you can still sync to your computer via that Micro USB port. I even managed to jailbreak my phone with the Juice Pack Air attached. I have been using my Juice Pack Air for about a week. The slightly thinner design of the Juice Pack Air over the Juice Pack Plus makes it less of a chunk in your hand or pocket, but it isn’t by much. Both are quite bulky to accommodate the extra battery. However, the added charge power of the Juice Pack Plus make it more appealing for those wanting a lot of juice. Both devices are great and if you are looking for a top up at the end of the day then the slimmer Juice Pack Air would suit you. If you are wanting as much extra battery as you can the Juice Pack Plus might be more suited to you.